How do I move subscription button next to input field? I would like to know how I can move the subscibe button (not the others), which is currently located below the input field, to the right side of the input field similar to the search box. 1. Do you know what css class defines the subscribe button? I want to put a margin-left: 3px; on it. Inspecting the element in Firefox doesn’t really help me. 2. How to remove the red border that appears, when you click on the input field for the subscription and leave it empty?! 3. The default text in the subscription input field is in a light grey color (#8d8d8d). Do you know how to do this for the search box input field (or for all input fields, while we’re at it)? Right now the default text in the search box is the same as the “typing color” (#2c2b2b). Do you know what css class defines the subscribe button? I want to put a margin-left: 3px; on it. Inspecting the element in Firefox doesn’t really help me. How to remove the red border that appears, when you click on the input field for the subscription and leave it empty?! Shows up as a blue border for me, so that may be controlled by your browser style sheet. 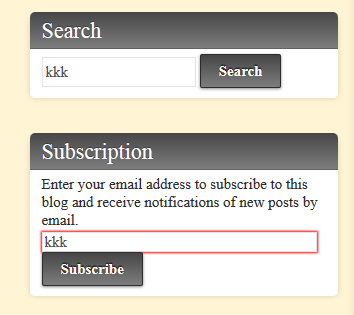 The default text in the subscription input field is in a light grey color (#8d8d8d). Do you know how to do this for the search box input field (or for all input fields, while we’re at it)?